Tag Archive | "lawn mower"
A fire spread from a lawn mower to a car in Nelson Township Monday. Post photo by L. Allen. 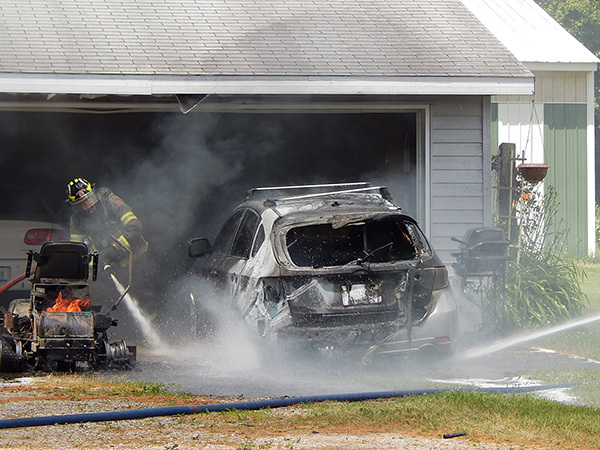 What started out as a fire in the engine of a lawn mower in Nelson Township Monday turned into something bigger when it spread to the homeowner’s automobile. Fraser said that the homeowner had been mowing the grass, then parked it next to the car and went into the house. When she came back out, she tried to restart the mower but it wouldn’t start, so she checked under the hood and found it was on fire. 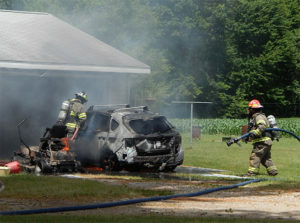 She then called 911, and the fire quickly spread from the lawn tractor to the car. Fraser said both were burning when they arrived on scene. The cause was undetermined. Sand Lake assisted at the scene, and Spencer Township Fire was put on standby in case the fire spread to the garage before they got it out. “It melted some vinyl on the garage but that was it. They were lucky,” said Fraser.